Against her better judgement, Sally May leaves the ranch in Slim’s care. While Slim naps, Hank and Little Alfred subject strawberry ice cream to rigorous product testing and then go for a ride in a mysterious spaceship. But it’s when Slim finally awakens that their adventures really begin. 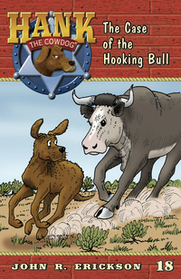 Hank saves Slim from sure death, endures a terrible whipping from the Hooking Bull, and much, much more.